Dinner at a spectacular campsite on the Drakyul caves pilgrimage route. You wake to the throaty bark of burly herding dogs and open your eyes to take in the sunlit, smoky interior of a large black tent. Your host coaxes you out of your down sleeping bag with a cup of steaming yak butter tea, and you gladly take a sip to ward off the chill. You pull on stiff boots, glad to find that a night piled close about a yak dung fire has evaporated all traces of yesterday's knee-deep snow and left them blissfully dry. 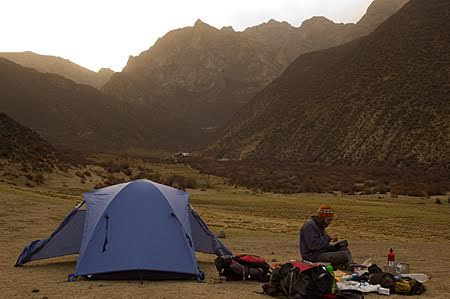 Pushing back the heavy door of the tent and emerging into the morning sun, you wonder what all those jaded backpackers you met in Lhasa were talking about when they announced so confidently that the real Tibet was gone forever. The onslaught of the Chinese tourism machine has most definitely taken its toll on the kingdom at the top of the world, and all-inclusive package tours abound in Lhasa. Tourists pay sums to be whisked around the province in Land Cruisers, often by Chinese drivers just as new to Tibetan culture as their clients. For independent travelers there are other more rewarding options available and Lhasa is just a few days hike from a "real" Tibet adventure. A good trekking guidebook to Tibet is essential and is one item you'll have to bring from home or buy in Nepal. English-language Tibet trekking guidebooks are not available in Tibet or elsewhere in China. If you find yourself in Tibet without a book, you may be able to track one down at a local trekking agency or outdoor store and photocopy some pages from it. One book that stands out as a useful source of information on Tibetan trekking is the Lonely Planet Tibet. The book features maps, monasteries, and a special chapter on trekking. There are many websites on trekking in Tibet, but most are for tours or via guides, so if you want to travel independently, you may glean information from the websites and the operators. There is very little tourist infrastructure away from the beaten path, and you'll need a tent, a sleeping bag, and a stove to stay warm and well fed. All of these things can be purchased or rented in Lhasa, though quality may vary. White gas for western liquid fuel stoves is not available in Lhasa, though pressurized fuel canisters for canister stoves are found everywhere. Owners of multi-fuel stoves capable of burning regular unleaded will find gas stations in Lhasa. Ration 4-6 ounces of liquid fuel per person, per trekking day. One 8 oz pressurized canister is enough for two people for three days of trekking. Warm clothing and a good pair of shoes are essential and can be purchased in Lhasa. Waterproof, high-top hiking boots are better suited than ventilated low-top trekking shoes to the snow covered high mountain passes common on Tibetan trekking routes. Gaiters, knee-high canvas leggings that attach to your boots, are extremely useful if snow gets above the ankle level. Purchasing equipment up to western standards may set you back more than it would back home, and poor quality fakes saturate the market. In Lhasa, Outlook Outdoor Equipment on Beijing Lu, opposite the Youth Hostel stocks hard-to-find items and offers good trekking advice. A place called Ozark Gear on Beijing Lu about two blocks west of the Yak Hotel sells good quality Chinese made sleeping bags and clothing. Even if you are planning to stay with locals on your trek, it's a good idea to bring enough food for the entire trip. Though western style dehydrated "backpacker meals" are not available in Tibet, a wide variety of non-perishable foods at the local supermarkets makes it easy to eat well on your trek. Hot chocolate, dehydrated fruits, candy bars, and instant noodles make good staples. Harder to find items like cheese, granola, powdered soups, and even tortillas can be purchased at the tourist restaurants along Mentsikhang Lu near the Barkhor district. Uncooked rice is probably best avoided due to large amounts of fuel associated with long cooking times. 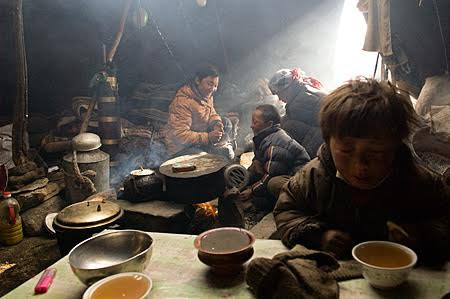 Friendly locals: For accommodation on a Tibetan trekking trip, nothing beats the warm interior of a nomad family's tent. Drinking large amounts of water is the most important key to beating the altitude (see below). Tibet's backcountry is full of grazing yak, sheep, and goats so stream water must be treated. Iodine, chlorine, and mechanical filters are all good treatment options. Western filters cost a fortune in Lhasa, iodine isn't available anywhere in China or Tibet, and Chlorine tablets were in stock in limited quantities at Outlook Outdoor Equipment in Lhasa at the time of writing. Boiling water is effective, but Tibet's high altitude puts the boiling point lower. Bring water to a rolling boil for at least a minute before drinking. Water from locals is a good way to fill water bottles when passing through small villages. Though they may not have much if anything to offer in the way of food, every family keeps a large thermos of boiled water on hand. Just be sure you know what you're getting before pouring, or you may end up with a water bottle full of yak butter tea. 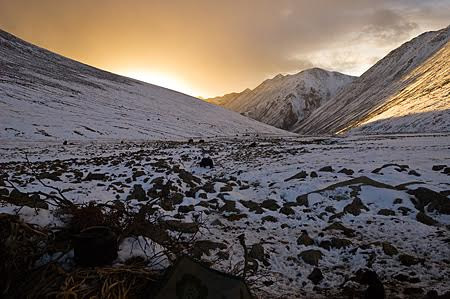 Altitude and the related effects of Acute Mountain Sickness (AMS ) should be taken seriously when trekking in Tibet. If ignored, AMS can progress into High Altitude Cerebral Edema (HACE) or High Altitude Pulmonary Edema (HAPE), both of which can be fatal. Read up on the subject on the internet. On arriving in Lhasa, you'll find yourself breathing heavily when doing simple tasks and will probably have a mild headache. This is normal, but you should give yourself a few days to acclimatize before trekking. On your trek, try not to sleep at the day's highest elevation. Most importantly descend to lower elevation immediately if any of your companions seem to act drunk, complains of a headache that is not relieved by ibuprofen, or becomes nauseous and gets sick. Someone who could walk themselves down by headlamp at night may become unable to do so by morning. Worth the effort: An impressive sunrise makes it easy to shake off the chill of a cold night. Somewhere between Hebu and Samye. A major decision to be made before setting out on a Tibetan trek is whether to hire yaks. Yaks can be rented in villages of almost any size, and can make a trek more enjoyable by taking weight off of your back. Yaks come with yak men to herd, handle, and feed them and these yak men (though they often speak very little English) can double as guides. Anything up to an 8 day trek can conceivably be handled by strong hikers without yaks. The large food and fuel requirements for longer treks usually make yaks a necessity. On non-loop treks, it is standard practice for the customer to pay for the extra days it will take the yak man to return to his home village. Unmotivated yak men may grumble about early starts, or lie about weather conditions to push for less ambitious trekking goals. As the paying customer, you may have to politely insist on a schedule that suits you. On paper, travel in Tibet is heavily controlled by the Chinese Government and depending on the area you hope to visit you may need as many as four different permits. In practice, these permits are often little more than money making schemes to ensure you are the best revenue source you can be. Rules for foreigners on local buses change frequently in Tibet. Check online travel forums for current details. Hitchhiking can be a viable option, but travelers shouldn't expect free rides. Tibetan drivers can get in trouble for carrying foreigners, and will expect to be paid. Chartering Land Cruisers at travel agencies in Lhasa is easy, but expensive. Operators will try to steer visitors towards all-inclusive package treks. If in doubt as to whether transport is available from one remote village to another, it is usually safe to assume that some combination of money, wheels, and beasts of burden will make any journey possible. In the end, the most valuable advice for creating an unforgettable Tibetan trek is to be flexible. Creative solutions to the above described hurdles can be the most rewarding parts of your journey. Oh, and watch out for those Tibetan Mastiffs: they're vicious. Carry a big stick: seriously. Since graduating college with a Physics degree, Andris Bjornson has spent time as a wildland firefighter, a State Department diplomat, an adventure trip leader, and an Asia-traveling backpacker. While that sounds more like the resume of a schizophrenic than a photographer, it's his taste for adventure that's the common thread. Andris is currently trying to make it as a travel photographer/writer and hopes to help decrease the world's empathy deficit by allowing viewers of his images to connect with the subjects. Please visit his website for more. Buddhist Festivals in "Little Tibet"